The Delta Dental Tooth Fairy encourages Boo at the Zoo participants to get their free fluoride varnish application. Nov. 9, 2018 | Some of Central Arkansas’ witches, ghosts and goblins are smiling bright thanks to the University of Arkansas for Medical Sciences (UAMS). 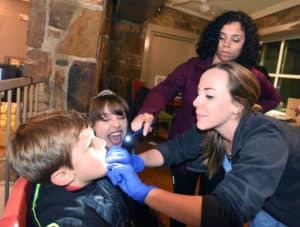 The UAMS Delta Dental of Arkansas Foundation Oral Health Clinic and the Office of Interprofessional Education teamed up to provide free fluoride varnish applications to more than 60 children at the Little Rock Zoo’s Boo at the Zoo Oct. 24 and 25. Ashley McMillan, D.D.S., examines a trick-or-treater’s teeth during Boo at the Zoo. Jennifer Stane and the Delta Dental Tooth Fairy look on. The response was very positive, said Wendy McCloud, an interprofessional education manager, although rainy weather on Oct. 25 did hamper the turnout that evening. Clinic employees and three dental residents from the General Practice Residency program were joined by 20 student volunteers who helped apply varnish or provide dental education. 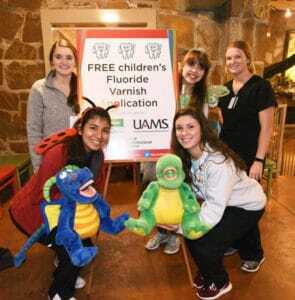 The fluoride applications were made possible by a grant from the Delta Dental of Arkansas Foundation. Delta Dental also provided goodie bags for the children, including sparkly toothbrushes that were a huge hit. 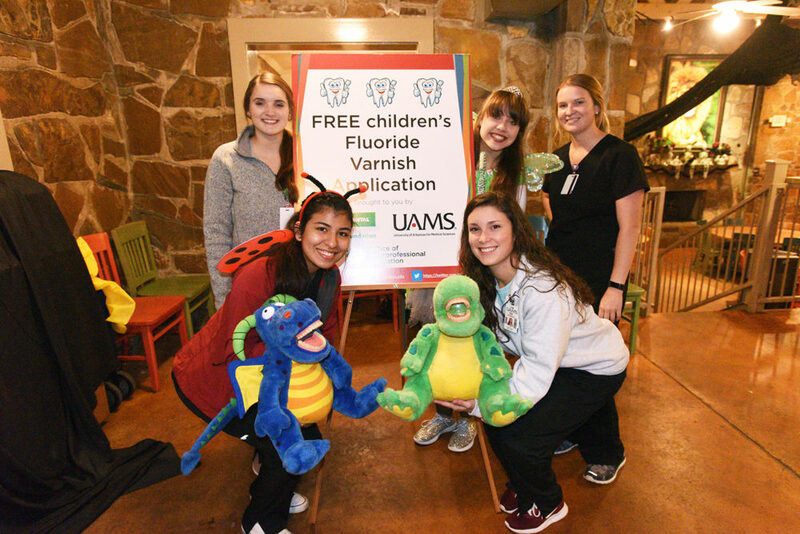 UAMS students used cute puppets to teach Boo at the Zoo attendees about good oral health. The children also liked the Delta Dental tooth fairy who was on hand for the occasion, McMillan said. The student educators, who were using dental puppets, also were a big hit, said McCloud. 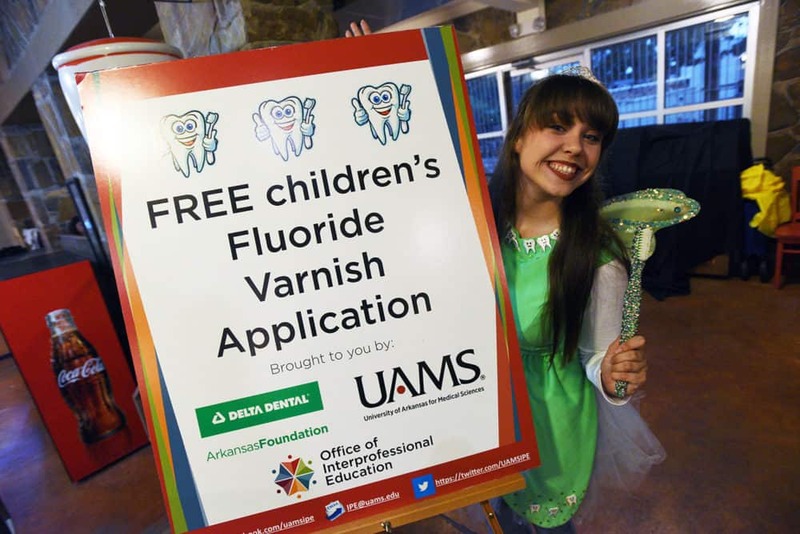 “Both the tooth fairy and the puppets made a huge difference in how the kids reacted to the varnish applications,” she said. This experience was a positive one for the students, said McMillan. “Our wonderful student volunteers were excited to have the opportunity to impact the community and to relate to the children in a fun, stress-free environment,” she added.